Discover a place where you can experience the beauty of the Chesapeake Bay, play with your kids or dance the night away under the stars. You’ll find your place in the sand in Ocean View, home to Norfolk’s beaches. 7.3 miles of free, accessible and beautiful shoreline along the Chesapeake Bay is ready to greet you. Ocean View’s gentle waters are great for children, kayaking, floating, swimming or sitting at the edge of the water. The level, continuous beach attracts joggers and walkers. The Department of Recreation, Parks, and Open Space maintains three beach parks. All three feature parking, restrooms, benches and shade trees. Community Beach Park 700 E. Ocean View Ave. Ocean View Beach Park 100 W. Ocean View Ave.
Sarah Constant Beach Park 300 W. Ocean View Ave. Ocean View Beach Park hosts summer concerts and dances. Visit the Ocean View Facebook page to learn more. All 7.3 miles of Norfolk’s beach is open to the public. You’ll find public walkways every few blocks, including in the East Beach area. 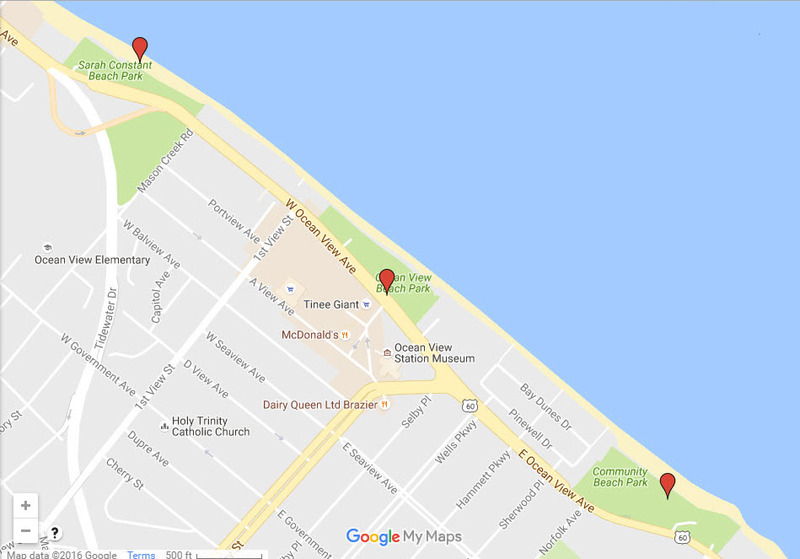 These locations have limited on-street parking and do not have public restroom facilities, but they provide the same access to the beach for swimming, boating, fishing and sunbathing. Note: Access ramps and walkways to the beach can be found at Community Beach Park and Ocean View Beach Park. For further information about city beaches, contact the Norfolk Department of Recreation, Parks & Open Space's Aquatics Division hotline at 757-441-1605. The aquatics team is always recruiting qualified lifeguard candidates. To apply for current openings, visit the City's Human Resources site.